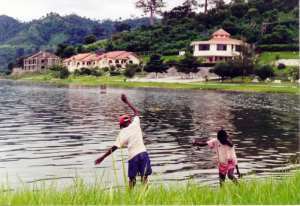 Abono (Ash), May 23, GNA - A Water Quality Specialist of the Water Resources Commission of Ghana, has warned that if care was not taken, Lake Bosomtwe could soon dry up. Madam Adwoa Paintsil who gave the warning, said the discovery of aquatic plants like the Salvinia weeds (Kariba weeds) and others in the lake was a clear testimony of the presence of large quantities of pollutants in the lake. She said such weeds thrived well only in highly polluted fresh water bodies which when not properly controlled could lead to the drying-up of the lake, Ghana's only natural lake and a source of revenue to the Bosomtwe-Atwima-Kwanwoma district and the nation. Madam Paintsil gave the warning after taking the press round to observe the aqua plants in the lake at Abono in the Bosomtwe-Atwima-Kwanwoma district of Ashanti last Thursday. She attributed the presence of the plants to the pollution of the Lake with soap and chemicals due to bathing and fishing in the lake. Madam Paintsil appealed to the district assembly to liaise with the chiefs and opinion leaders in the various communities along the lake to find a lasting solution to this problem. She said the aquatic weeds if not properly controlled could spread very fast and obstruct people from fishing in the lake as well as travelling on it. Mr Bright Addai-Mununkum, the District Chief Executive, noted that although there were byelaws against polluting the lake, people were able to violate the laws because the assembly did not have enough staff to enforce the laws. He, therefore, called on chiefs and opinion leaders along the lake to complement the efforts of the assembly by checking pollution in the lake due to farming and fishing.